Astronauts ventured outside the International Space Station last night to open the shutters on an observation deck that gives a panoramic view of the Earth below. 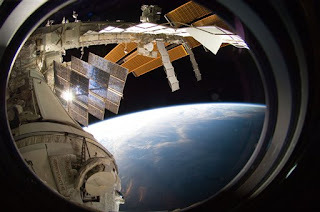 The seven windows of the $27 million lookout, called Tranquillity, were opened one by one as the crews of the station and the shuttle Endeavour carried out their third and final spacewalk of the 14-day mission. The US astronaut Robert Behnken and British astronaut Nicholas Patrick finally removed bolts on the dome-shaped observation deck's biggest window, which sprung open to reveal its first view of the Earth 200 miles below. The Italian-built dome, which is 5 feet tall and nearly 10 feet in diameter, is designed to offer sweeping 360-degree views of the Earth and outer space, as well as the space station itself.A robotic work station is currently being installed in the central cupola, which will allow the ISS crew to control station activities, including the ISS’s robotic arm, from inside the spacecraft. With the new room in place, the space station is now about 90 percent complete. Endeavour is due to end its mission on February 21. Penguin Corner - There's Always One! Nuclear Fusion on the Horizon? New Ag. Science Syllabus? Ah, no.